Welcome back! Today we will be showing you the brand new StampTV Kit from Gina K. Designs. Here is a look at the entire kit. I love that there are two stamp sets with dies to match, plus you get twenty four sheets of card stock and three additional large word dies. Here is a close up of the card I made using the first stamp and die set which is called Merry and Bright. 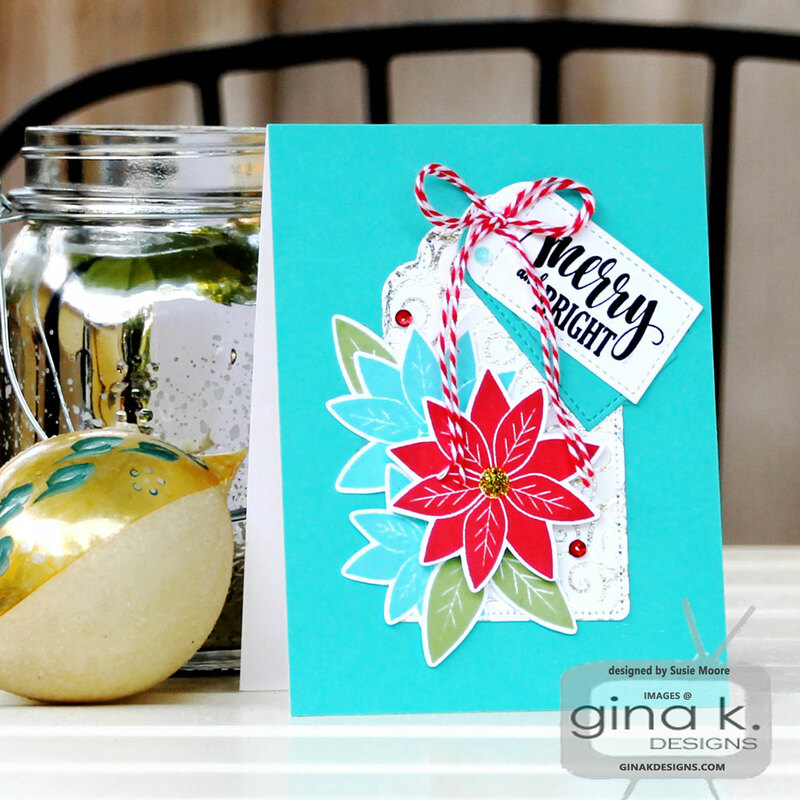 The detail on the poinsettia and leaf stamps comes out so clearly each time. To me that detail makes the image just pop! I couldn't resist using some foil on one of the new Decorative Tags. I used a second die from the set to make the sentiment tag. This is a terrific set!! Next up is my card using the other set in the kit and it is called, Seasonal Sentiments. I'm not sure if I could be more in love with a stamp set!!!! And can you see that little tag? Yes, it IS adorable and is also from the new Decorative Tags die set. And you will want to see ALL of the new products available this month in the What’s New section. The turquoise and red for the needles and cone are amazing! I love it! Pretty cards! I do not think of turquoise as a Christmas color, but it works. Thanks for the inspiration. Different color choice, but it really works! A beautiful card. I love the turquoise and red together, especially for a Christmas card. Definitely Merry and Bright. Beautiful cards. Love the turquoise and red. Thanks for being such an inspiration to us. Love the cards- Am getting my kit in the mail today and can't wait to use it! Love the turquoise and red combo! 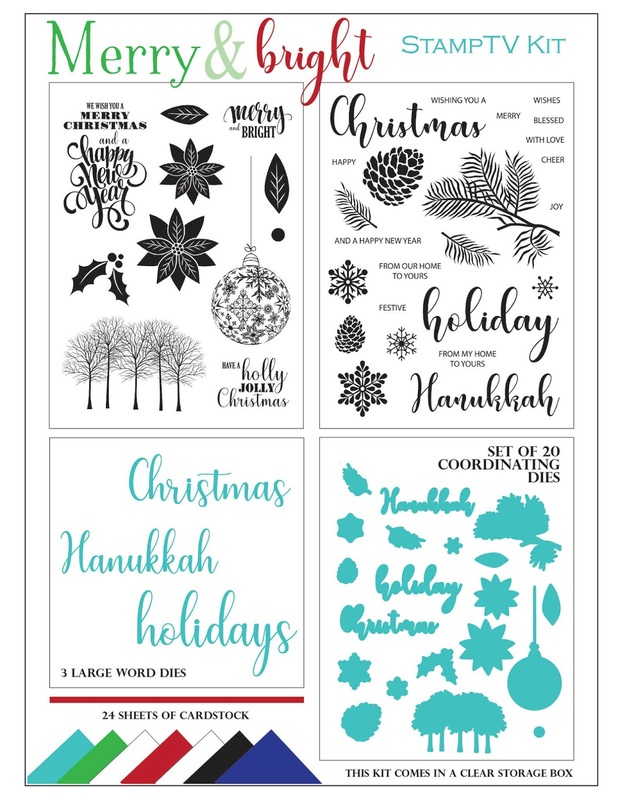 While it is a non-traditional holiday color combo it somehow seems very wintery and holiday-ish! Great cards-love the colors used! I would never think to use the color combinations, but they are fabulous! Me too, I would never have thought to use those two colors together, but WOW, it is beautiful. Thank you. Great cards. I really like the red and turquoise for a different holiday combo. Beautiful cards. Love both of them. Can't wait to get my kit! Love these bright and beautiful examples! Love these cards! The turquoise and red combo does make them so festive and so bright. Love your cards and color choices! Thanks for sharing! I love turquoise and red together (MY kitchen is done in those colors). Love the red pine bough! Your choice of colors is inspiring to say the very least! They make me think of twinkling lights and powdered snow banks. Lovely job! Beautiful colors on your wonderful cards. Susie, love your cards, love the color combos that you used too. Your non-traditional colors work! Lovely cards! I absolutely ADORE your color combos!! Very pretty!!! What a great hop as well!! Got TONS of inspiration and now I'm gonna go play!! Big Hugs!! Very pretty cards! Your color choice is really eye catching. Great color choices! I'm always afraid to try something different, but what you've done with your colors is gorgeous. Just got my kit today. Excited!! I like your unique color scheme for the Christmas holiday, and how you placed your bling. I'm inspired with the colors. Love the color combo on your cards. Never would have thought of using turquoise but your creations are stunning! The colors are striking. I adore clean and simple cards that can be mass produced. Thanks. Fabulous cards!! Love the non-traditional blue used in both!! Those colors are so sharp! Love your style! Would think to use those colors--but will now! Thanks for the inspiration. Very nice cards. Love this set. Love your color choices. Both cards just have a pop about them with the color choices. Thank you for sharing. I love your color combos and how the veins on the poinsettias and leaves look. Your tags are adorable. Love your color choices. Very pretty cards. Thank you for sharing. Lovely cards. What a fun color palette. You pick some really outstanding colors for your Holiday display. The red pine cone is a fabulous break from the traditional color and adds a festive flair to your card. Thanks for sharing and motivating. Wow! Love the non-traditional colors! Beautiful cards! Beautiful cards! I love your pretty color combos! Love your style, color choices are Awsome, always am amazed at your creativity. So pretty and the colors you used are so fresh and lovely for this new kit! Once again, you have rocked this hop with amazing style!!! BEAUTIFUL!!! Your cards are gorgeous with great colours combinations ! love the colors you used!.. nice! Wow ! 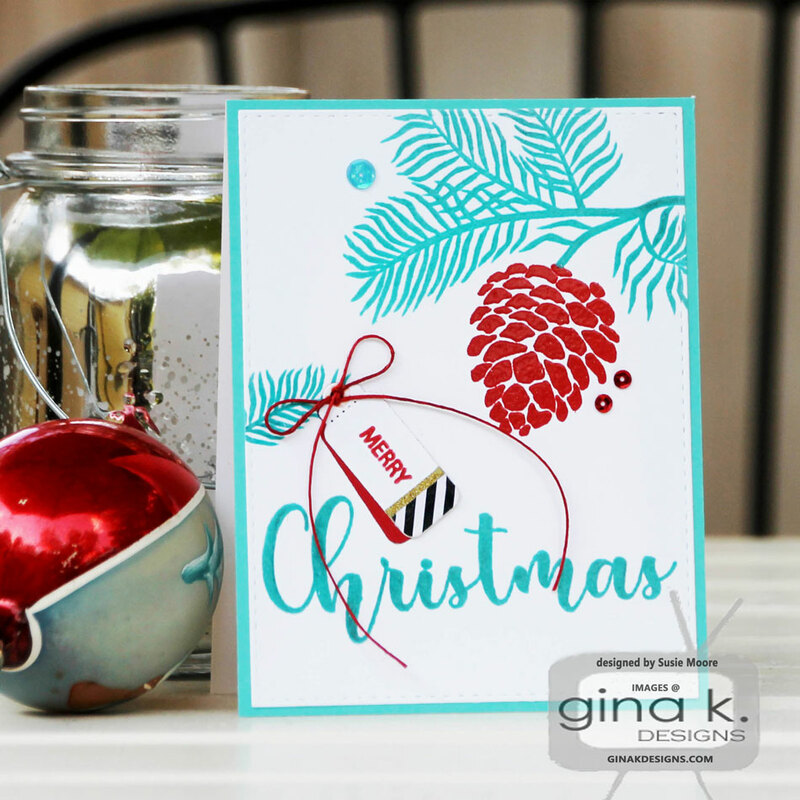 Turquoise is twist on Christmas but would really make your cards stand out. This Merry and Bright set really allows for diversity. 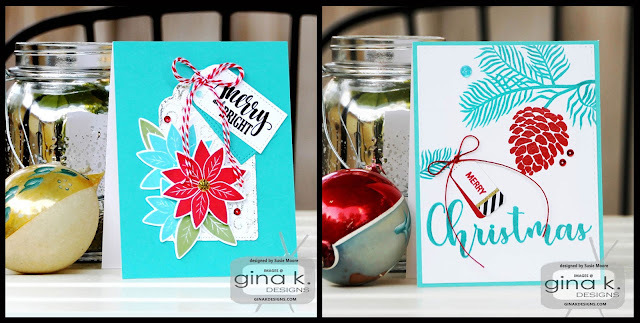 Such bright and happy cards - love the turquoise with the red. Love the colours you used, Susie! Your cards are always so stunning! The turquoise just makes your cards pop. Thanks for sharing. Wow! Beautiful and festive cards!!! Love more ideas of the bright Aqua color. Love it so much! Great cards. 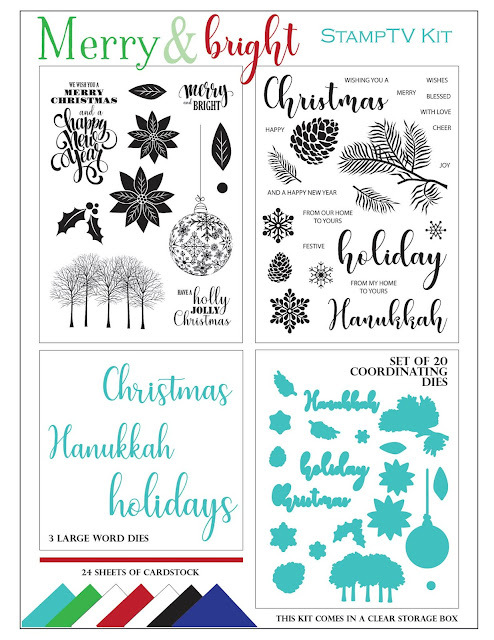 Interesting color choices for Christmas cards, and I love both colors.